There are moments when technology combines function and grace in such a way that the only fitting human response is "wow". It could be a car or some striking of modern architecture or design. Increasingly, it has been my reaction, when looking at some of the more sophisticated Internet web sites. But it happens all too rarely when looking at software, and in particular, software for research. That is, until I got my hands on a copy of Memphis Survey Explorer. This is a new end-user analysis package designed especially for market research from Icelandic software producer Memphis International. It could have been Norman Foster Associates. Benedikt Hreinsson, Memphis's Director of Sales and Marketing explained that their aim was to produce a tool that could be used by both researchers and clients or end-users. They commissioned Scantel International to conduct . "We found that 86% of market research companies surveyed here were interested or very interested in an interactive tool to analyse their data, but only 50% were certain that their clients would be interested. But our experience in Iceland has been that, after seeing it, none of the clients wanted to go back to receiving their surveys as printed tables, given the alternative". The most striking feature of the new Memphis Survey Explorer is its user interface. It is quite unlike any other application I have seen. Gone are the dreary grey boxes, stark menus and lumpen toolbars. Survey Explorer's interface is a statement about design - and that design is taken straight from the Internet. Just about everything you need to use to create tables or charts is presented as a single screen, or "home page", if you are thinking in Internet terms. As you roll the mouse around this screen, hot-spots reveal themselves, icons change colour and text fragment appear, tempting the user to explore and see what options lie in wait. The main screen is essentially a tool to allow you to choose what you want analysed. They use the terms "analyse" and "categorise". You can also select and create filters. You pick the questions from lists which are grouped hierarchically to make selection much easier. Once you have selected what you want to see, you choose one of the four main viewing tools: bar charts, pie charts, tables and "compass diagrams", for target market definitions. It will not produce every type of chart imaginable, nor every type of table. But what it does is present information in a way that market researchers want to get to it. The "default" chart is the clustered bar chart, the graphic equivalent of the cross tab. A single mouse click alters the basis of the chart from real value to percentage within group or percentage within category, to give you real side-by-side comparison. They seem to have made exploring the data as natural and effortless as possible. For example, if you know what information you are looking for, you can perform a word search on the questions, and it will present a reduced list of questions that contain that word or phrase. It is hard to grasp that this package has such a wealth of features and options, since they remain invisible until they pop up at the moment you need them. Creating complex filters; merging categories, handling missing information, performing transformations on the data, adjusting the appearance of the output, changing titles, headings, adding annotations - it is all there in the ever-changing right mouse button menu. It is also very fast, offering instantaneous analysis of thousands of cases. In terms of getting the data into Memphis, they have embraced the Triple-S standard, and also provide a translator from SPSS. Sigfus Halldor, Memphis's software designer told me they aim to provide translators for all the major packages in the next year. You then use their Survey Transformer tool to create the Memphis database. Its main function is to allow you to create the question groups to simplify question selection for the end user. Once the survey has been "transformed" in this way, the end user no longer has access to individual records, and cannot alter the data in any way. Memphis feel this is an important security feature for research agencies wishing to deliver their surveys to clients. Kristinn Olafsson, Project Manager at Gallup Iceland, has been using the Memphis package since it was first developed two years ago. He has been working closely with Memphis on the new version, and is very satisfied with the outcome. He says: "We think it is a very good product, easy to use and user friendly. People in business have very little time to learn new programs like this. If it takes more than 5 minutes to get it running and to use it, it is too complicated to use." Gallup have found clients to be most accepting of delivery by Memphis on two types of study: the large syndicated or TGI-like studies, and on what they term "top of mind" studies, or month-on-month tracking studies. Kristinn Olafsson continues: "We are doing a lot of top of mind studies and delivering the new data by e-mail, so that the client builds up a database on their computer" We find that it is much more the bigger companies that are doing serious marketing that are using this product. It is very handy for them to have a system like this because they are always examining a lot of data and they find this very useful to get answers that they don't get from hardcopy." What this does mean is that the relationship between the researcher and the client starts to change. This can make researchers nervous if they perceive their value as being in explaining the findings to their clients - what role will they have if all they do is collect the data and hand it on to the client? Gallup's experience in Iceland has been of much greater loyalty from its clients. Presentation still take place, and the researchers also use Memphis to gather key findings. But they spend less time running extra analyses for their clients, which are inefficient and unprofitable. Benedikt Hreinsson described the situation facing most clientside researchers as "drowning in data but doesn't have any information to use". Perhaps the ultimate "wow" of this product will be not what it looks like, but what it lets you see. 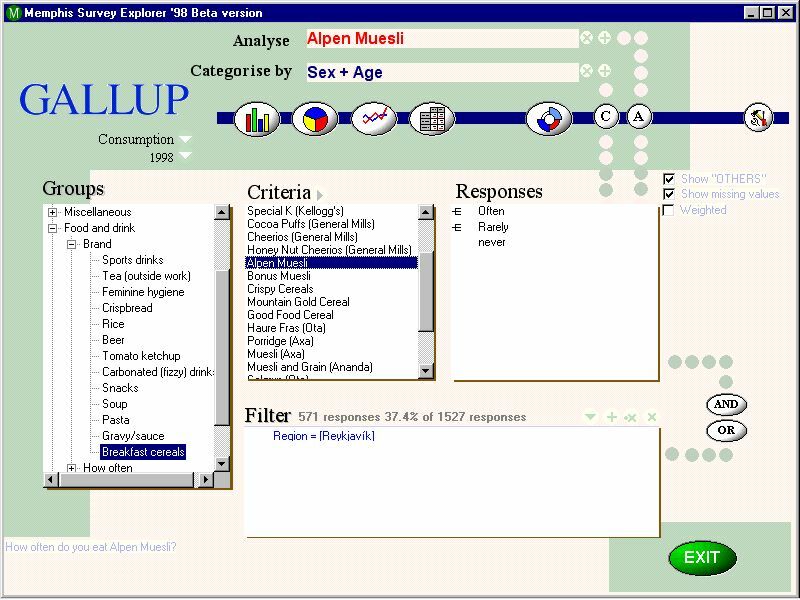 Memphis Survey Explorer 3.0 is due for release on 1 September. Contact Memphis International on 0171 345 1322. Published in Research, the independent voice of market research, August 1998, Issue 387. © Copyright Tim Macer 1998. All rights reserved. Reproduced with permission.